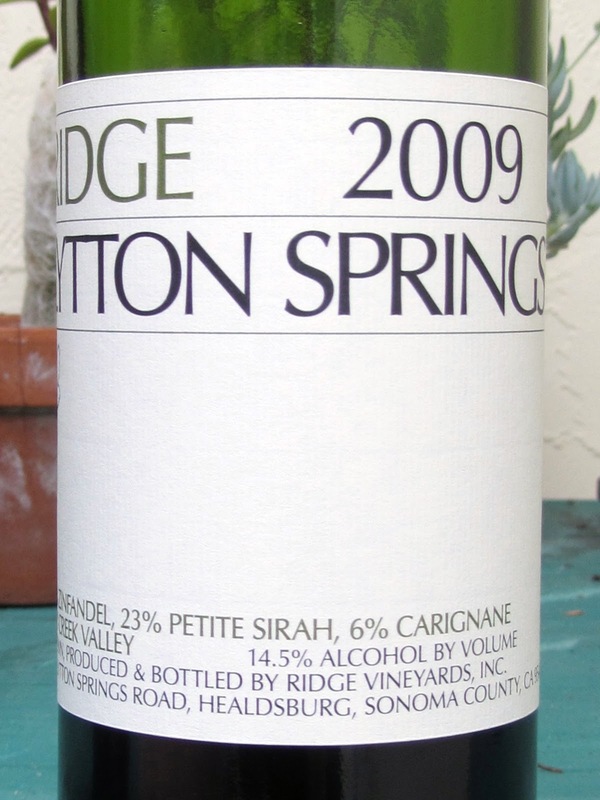 An Ideal Wine : One Generation's Pursuit of Perfection - and Profit - in California, by David Darlington, chronicles the California wine industry primarily through two players: Randall Grahm of Bonny Doon and Leo McCloskey of Enologix. Into these two people's main stories, the book seamlessly integrates numerous other interesting tales ranging from the outrageous Beverly Hills Wine Merchant, to the rebuilding of the wine educational system post prohibition, to the formation of Kendall-Jackson, Two Buck Chuck, and [yellow tail], just to name a few. Randall and Leo take very different paths to try and create great wine, exploring drastically different parts of the wine world, both equally interesting, and sometimes in opposition. Randall searches for the perfect terrior, while Leo uses state of the art wine analysis. I really enjoyed this 337 page book. Both of the characters are interesting and I love the way the author integrated the multitude of interesting subplots. I feel like I've learned a lot about how wine is made and the history of California wine. Reading this book has also put a hankering inside me to revisit Bonny Doon, now that I have a history of the place, the man behind the wine, and his struggles. I also wish I could do some sort of blind tasting of a Randall vs Leo wine. 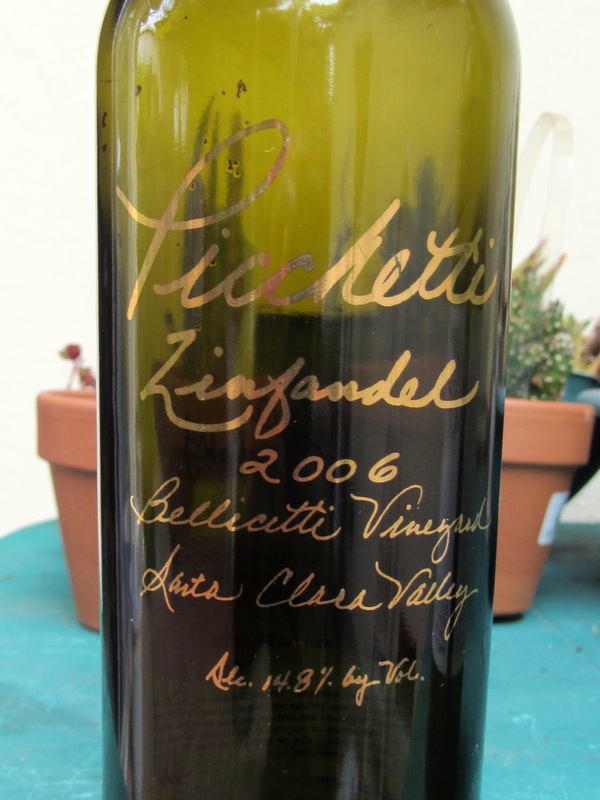 "The great pinots are the greatest wines. They're captivating-they have depth, seductiveness, fragrance, complexity... 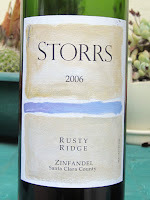 There's nothing like them-they're unrivaled"
Pinot being one of my favorites, how could I not like this. 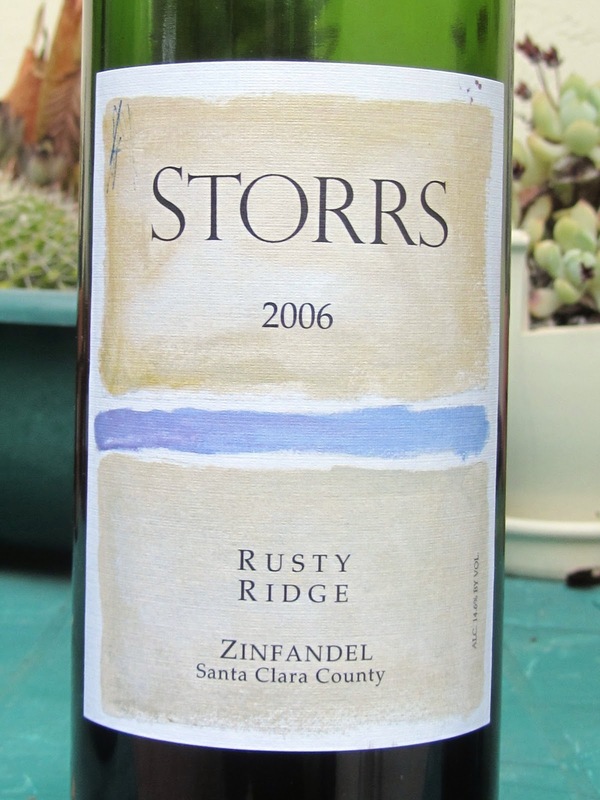 His description of Zinfandel : "oversized, loud, blustery, lacking finesse...the SUV of grapes...a wine for enthusiasts, not connoisseurs." I'll be using this to prod Jose, a good friend and Zinfandel nut, for years to come. biodynamics - Think organic farming to the nines and a little crazy. lees - The leftover junk (sediment, pulp, and yeast cells) that settle out of a wine after it's been pressed. They consume oxygen, contributing to the chemical process known as reduction. micro-ox - The controlled injection of oxygen into wine to help soften the tannins. reverse osmosis - A filtration process that separates a wine's flavor and color from its water and alcohol. 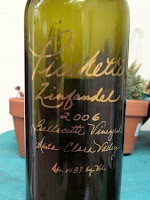 I just received an email from K&L titled "May be the single finest value in American Pinot Noir" - Wine Advocate. How on earth am I supposed to be able to not at least try a bottle of this stuff, especially at $19.99? I think the best strategy is to not receive the email. On a reread I'm not certain I originally saw the word value. I believe I read "May be the single finest American Pinot Noir" when I ordered it. Just a slight difference. A couple of weeks ago, Ted, Shannon, Sue and I took a couple of classes at The Mountain Winery: Wine Tasting Basics: See, Sniff, Sip, Sense and Component Tasting. The classes were taught by Ilyse Pender, a certified sommelier and then some. She seemed a little timid at first but quickly warmed up to the group, sharing her knowledge in a friendly manner. She explained that this was the inaugural class and they were still working out some of the kinks. Interestingly, the classroom was right behind the stage where the Devo roadies were setting up for the show that night, not that we could hear any of their work. 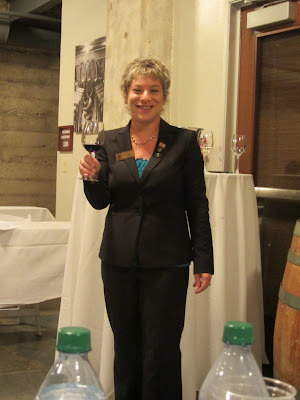 This class covered the basics of wines tasting delving into a See, Sniff, Sip, and Sense system. Most of this we'd had before, but a review every year or so is always fun. For smell she taught a FEW system, (F)ruit/Non-Fruit, (E)arth, and (W)ood, accompanied with a handout of common smells in the category, which worked well. Don't initially swirl the wine before your first smell. There are delicate aromas that may be lost when swirling. Oak tannin can be sensed as a drying sensation on the back of the tongue. Fruit tannin is sensed on the gums of the front teeth. The second class was more intimate, about half the people from the first didn't attend. 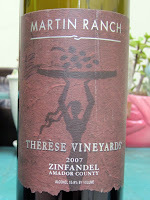 First we learned where on our tongues we tasted sweetness, acidity, and tannins. This was followed up by giving us four glasses of Chardonnay, 3 of which were spiked. 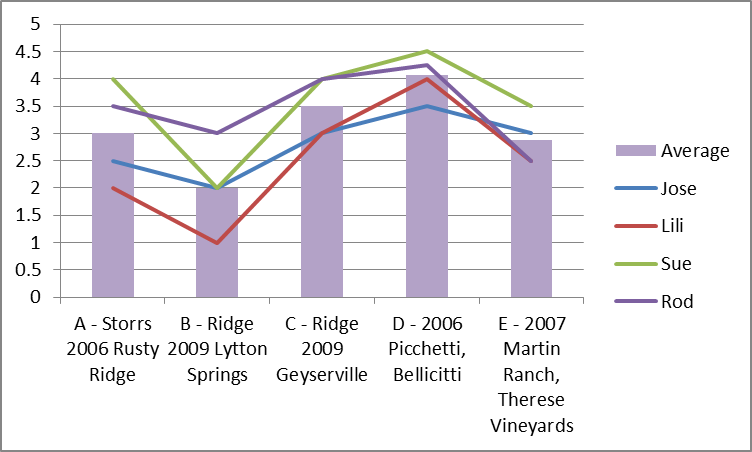 Our task was to determine how each was spiked, either with sweetness, acid, or tannin. This sounds simple, but wasn't, at least not for me. Next they had us pour the wine of our choice and decompose it with the help of different FEW stations set up with the different components. We moved from stations to station, smelling the components and trying to find matches in our wine. I found this immensely helpful, and wished I had a box full of these smells. The first class was well worth the $25. The second class seemed a tad expensive at $40 for what we got. If they add in a little more structure I think they'll have a winner. While we were not there to strictly wine taste, we did get to taste and decompose most of the wines they had to offer. We also purchased a couple of cheese plates for lunch, not our original plan, but worked well enough, and checked out the tasting area. 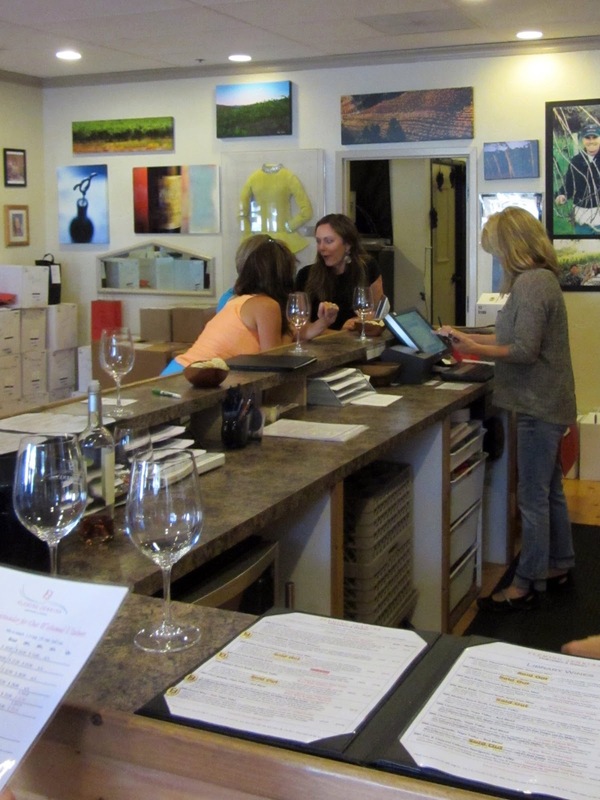 The winery has a beautiful outdoor tasting room with a great view, and plenty of room for hanging out with friends and tasting wine. The wine was good, but nothing really stood out to me. They also are a fantastic venue for concerts. A little expensive, but mostly worth the intimacy. During one of the classes, I asserted that it is illegal to add sugar to wine in the United States. Only European wine makers could add sugar while only US wine makers could add acid. It turns out this is false. Chaptalization, adding sugar to unfermented grapes in order to increase the alcohol content after fermentation, is legal in the US, though not in California. "In the United States, federal law permits chaptalization when producing natural grape wine from juice with low sugar content. This allows chaptalization in cooler states such as Oregon, or in states such as Florida where the native grape (Muscadine) is naturally low in sugar. 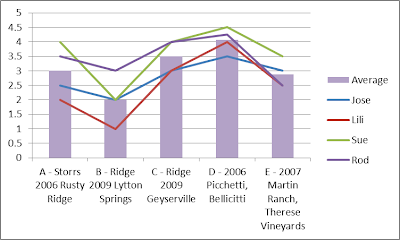 However, individual states may still create their own regulations; California, for example, prohibits chaptalization, although California winemakers may add grape concentrate." I lost $5 on this bet and sent Ilyse a "you were right" email. We streamed Blood into Wine on the recommendation of Fred Reiss, our pourer from Skov Winery. Our preference was to watch his Mondovino recommendation, but this was unavailable for streaming on NetFlix. We'll have to wait for the DVD. 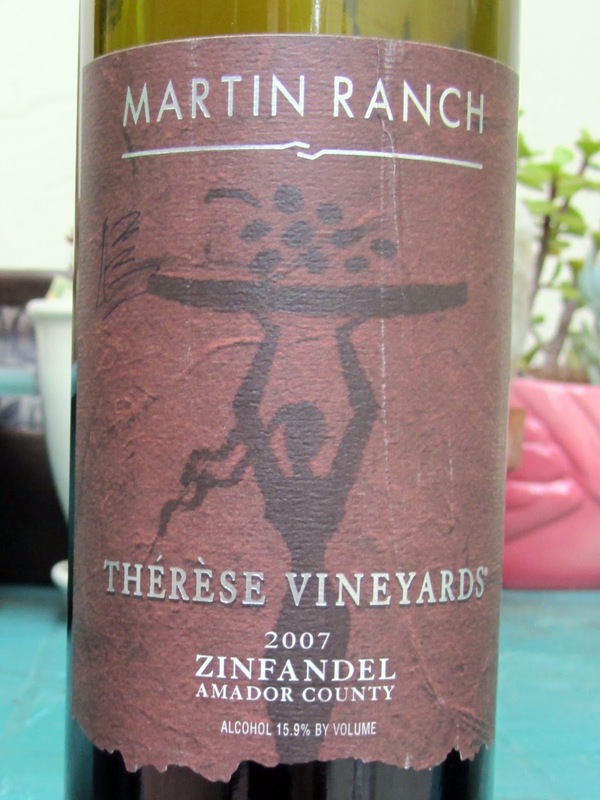 The movie is an interesting look at Maynard James Keenan's journey to make wine in Arizona. Maynard is the lead singer of Tool, A Perfect Circle, and Puscifer; none of which Sue nor I are very familiar with. 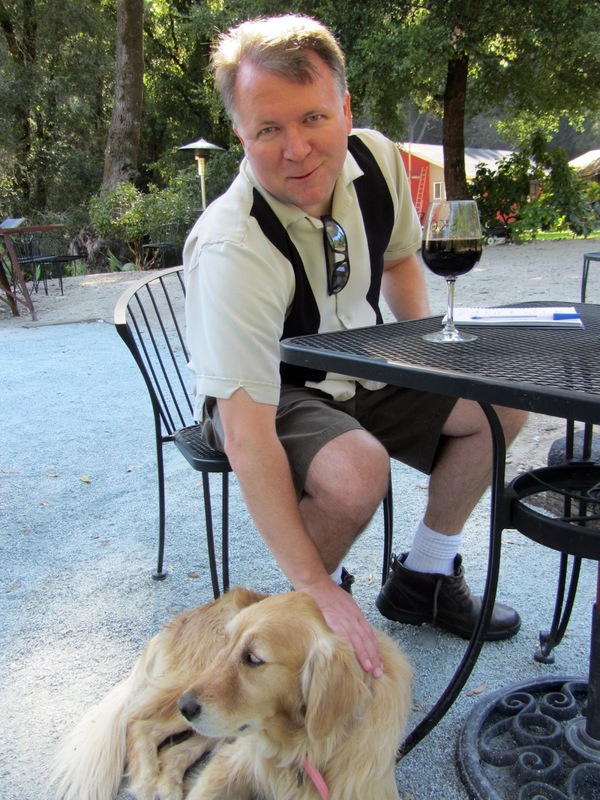 Maynard teams up with Eric Glomski, previously a wine maker at David Bruce, to create a winery: Cadeceus Cellars. 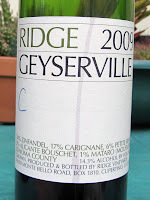 The movie is more about Maynard's journey than wine making in general. He's a pretty interesting character, but the movie probably fares better with his existing fans. We would have preferred more wine related information. We give it a weak recommendation. Maynard used this incredibly cool fish corkscrew. I wonder how many of these they have sold since the movie. I know we ordered one. The wine sounded pretty interesting and we'd love to try some, though a lot of it seems sold out on their web site. I recommend this movie. I liked it, giving it it three stars out of five. Q: Was that show at the beginning real? It seemed way to unbelievable to be real. On a whim I thought it would be fun to have a simple dinner and blind wine tasting with the Fosters. I figured the chances were slim sending a text at 5:30, but was pleasantly surprised when they replied that they were in. We had caught them just in time; they were pulling out of their driveway about to go to a dinner reservation at Town. 45 minutes later they were at our house wanting to socialize and ready to try some Pinots. I wanted to try out a couple of wines I had recently picked up. 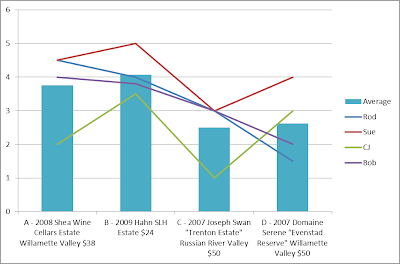 The first wines I wanted to try were two Oregon Pinots I picked up on a recommendation from an acquaintance at work. 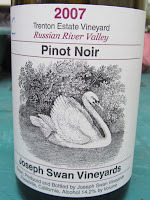 The third wine I had also picked up one of the highly ranked Russian River Pinots Wine Enthusiast recommended in a recent round up of the region. 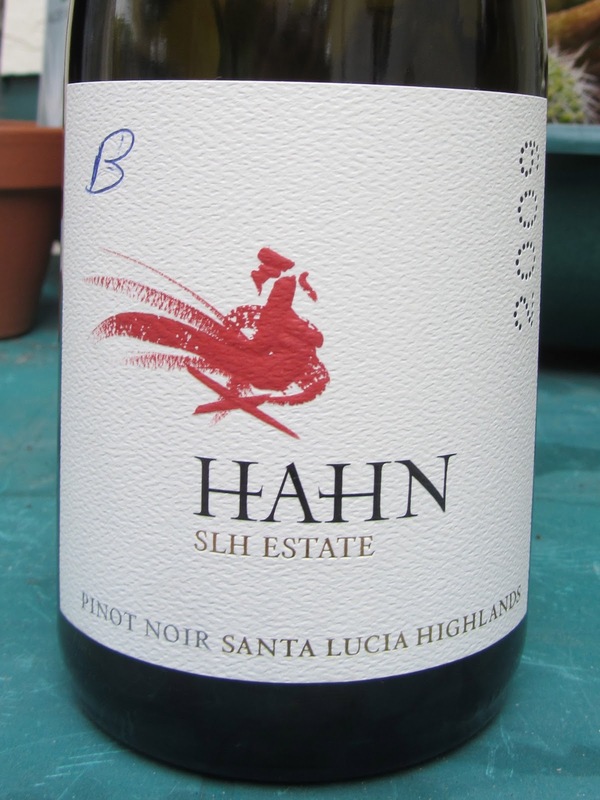 To make an even four, I threw in a random Pinot we had picked up from Hahn that I knew I would not be able to identify by taste. 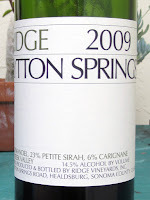 I only knew I had liked it enough to buy it when visiting the winery, which can mean less than you think. I wanted to start off with a white, since Carolyn prefers them, but all I could find was a cold Lambrusco. I poured a little in an attempt to entertain Bob and Carolyn as I put the final parts of the tasting together. It didn't go over very well. Sue loves this stuff, but I'm iffy on it, as were our guests. Kaitlynn begrudgingly helped me randomize and number the bottles. She insisted she would rather be working on homework. It was a Friday night, I somehow doubted it. I felt the love. I told everyone what I knew of the Pinots. I wasn't certain this was the best policy, but I thought it might give me some advantage, so I risked sharing the knowledge. 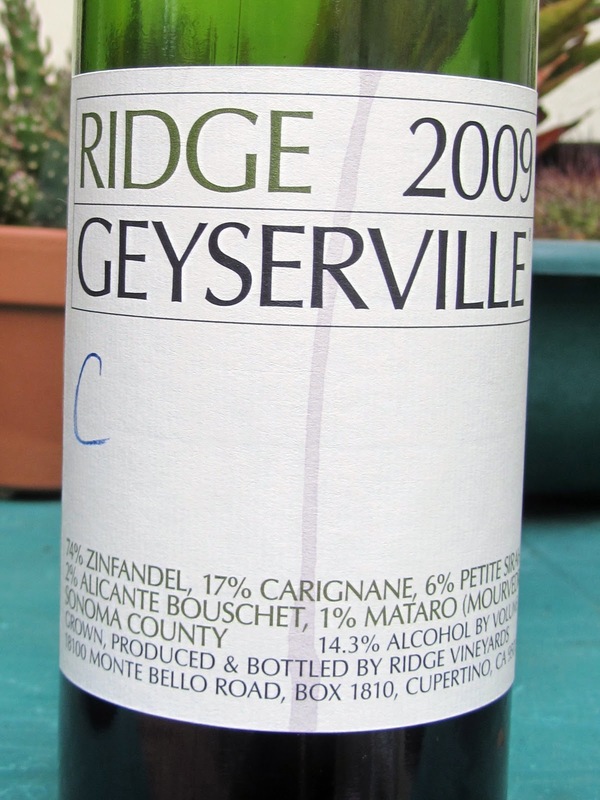 I knew that two were from Oregon, one was from the Russian River Valley, and one was from Santa Lucia Highlands. 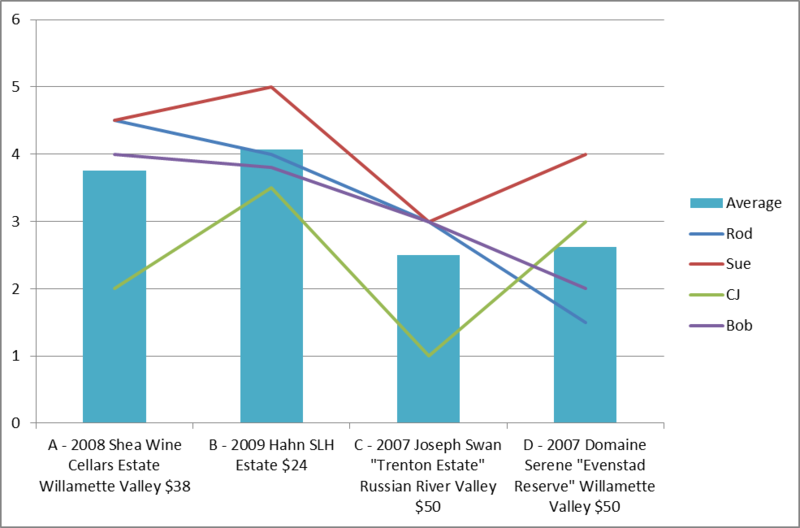 Knowing this allowed us to also take a guess at the regions of wines, as we tasted. 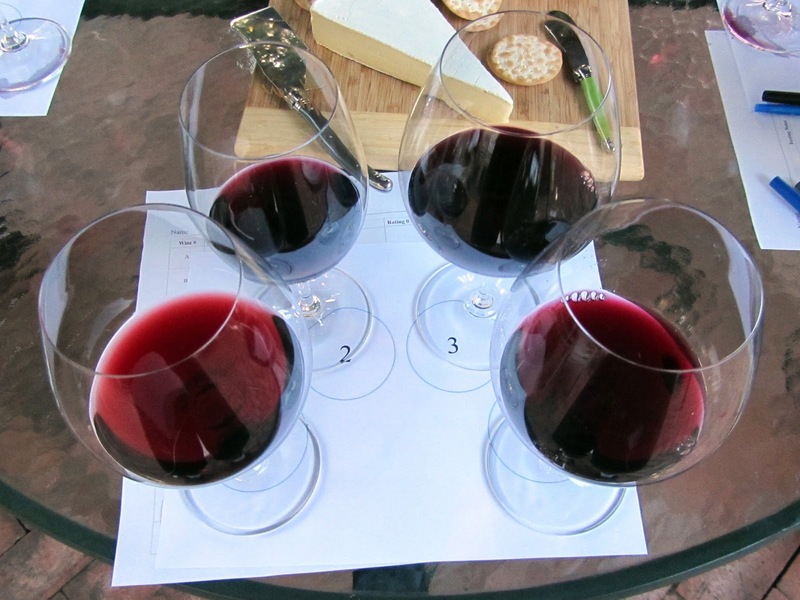 For close to a couple of hours we examined, smelled, and tasted the four wines. After allowing everyone to form their own opinions, we talked about what we were experiencing. We had fun resampling and comparing the wines. 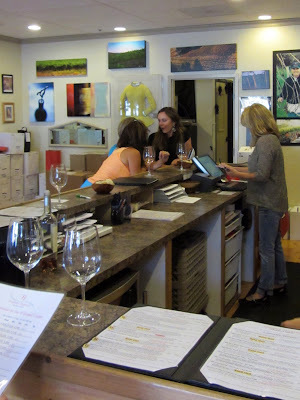 Having all wines in front of us allowed everyone to refine their opinions. Some even drastically changed. Bob originally gave D a 5, noting a taste of chocolate, but ended up lowering it to a 2. It's possible obvious that we influenced each other, but it was more enjoyable this way. Finally we tallied up the scores and revealed the wines. B - 2009 Hahn SLH Estate Pinot Noir came in first place with an average of 4.075. I can't remember what we paid for it at the winery. It looks like retail is $29, but I found on the web for $24. 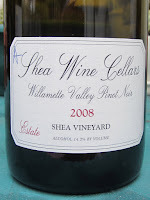 A - 2008 Shea Wine Cellars Estate Willamette Valley Pinot Noir came in a close second with an average of 3.75. I paid $38 for this from K&L. 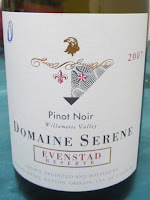 D - 2007 Domaine Serene "Evenstad Reserve" Willamette Valley Pinot Noir came in third. I paid $50 for this from K&L. This was the recommendation of an Oregon Pinot lover acquaintance at work. 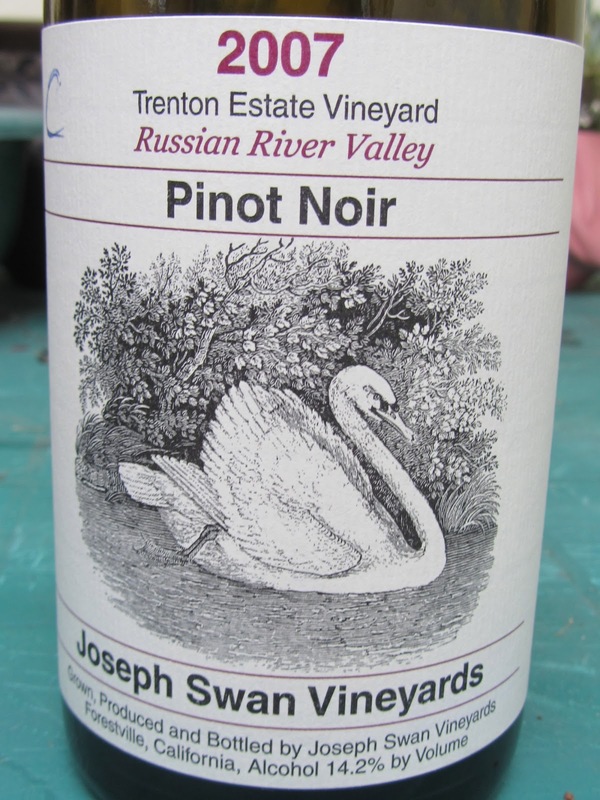 C - 2007 Joseph Swan "Trenton Estate" Russian River Valley Pinot Noir came in last. I paid $50 for this from K&L. Wine Enthusiast ranked this as their #1 classic pic from the Santa Rosa Plains, giving it a 97 and an Editor's Choice. I was shocked that the Hahn came in first. I was convinced the crappy D was the Hahn. 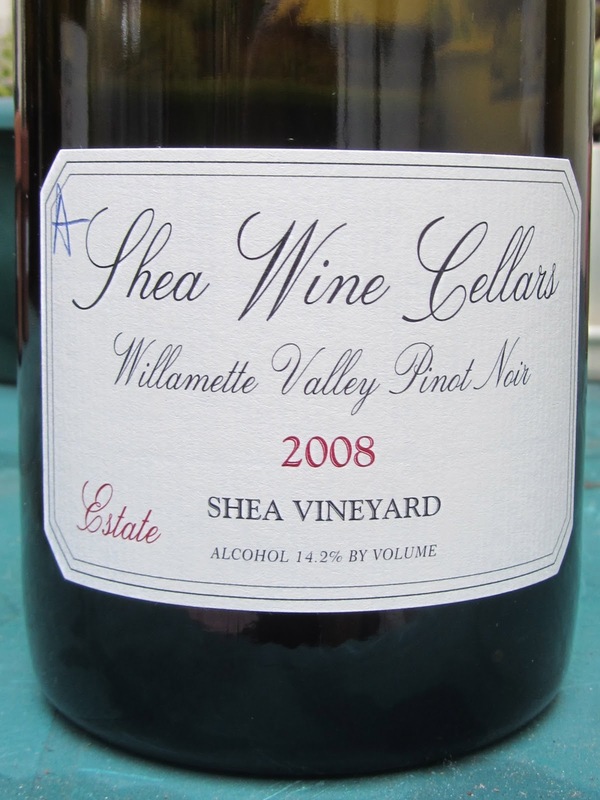 Wow was I surprised when it turned out to be the main recommendation from the Oregon Pinot lover at work. I thought A, B, and C were all very good. My top to bottom order was A, B, C, D.
We dug into pizza and pasta from Amici's, enjoying more of each other's company before calling it a night.